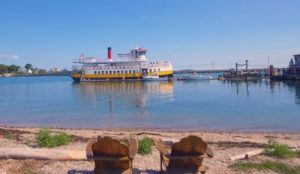 Whether you have all day or just a couple of hours, the best way to see Casco Bay is from the deck of one of our ferries! Most people know us as Portland’s iconic ferry system transporting people to and from the islands. 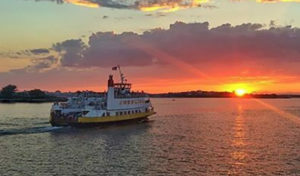 But if you’re just looking to get out on the water, Casco Bay Lines offers a variety of specialty cruises with different destinations, durations, and departure times. 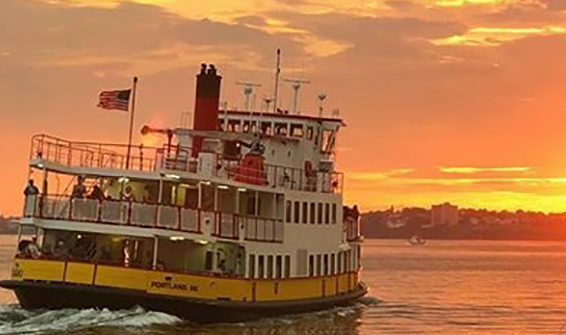 We make it easy to cruise the bay—just pick your cruise from the list below, pack a bag with refreshments of your choosing, sunscreen, and an extra layer, grab your ticket at our terminal located on the Maine State Pier, and come aboard! Click on any of the cruises below for schedule are fare information. Trip times vary based upon route and cargo volume. 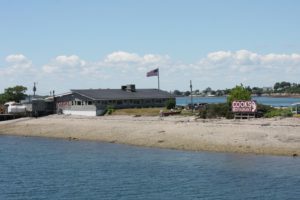 Frequent departures to this bustling nearby island community, once known as the Coney Island of Maine, makes the Peaks Island run an ideal, family friendly option. Year-round availability. Hop on the Mailboat! 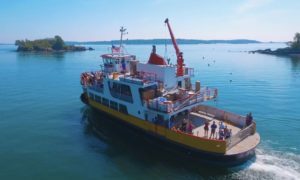 The locals’ favorite way to experience Casco Bay – this true working boat carries passengers, mail and freight to Little Diamond, Great Diamond, Long, Cliff and Chebeague Islands. Year-round availability. Narration provided with 10 or more cruise passengers. Take this scenic cruise of the Inner Bay past island cottages on the shorelines of Little and Great Diamond Island and Peaks Island. Catch a glimpse of island life as we travel to four different stops. Seasonal availability. Portland shimmers in the distance as you enjoy your picnic spread and relax in the twilight of a perfect Maine day. Year-round availability. Pack a thermos and join our crew, the sea birds, local lobstermen and the occasional seal as they all begin another day on Maine’s Casco Bay. Year-round availability. 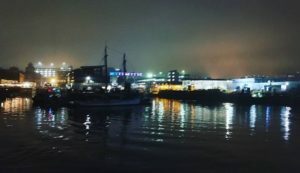 Harbor lights twinkle brightly as the ferry makes its way through the moonlit waters of Casco Bay. Seasonal availability. The Captain narrates the history of Casco Bay as we cruise past lighthouses, forts and 19th century summer colonies. Enjoy a 2-hour stopover and dine on Down East cuisine or bring a picnic lunch and stroll the nearby beaches. Seasonal availability. 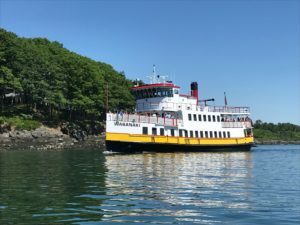 The narrated noontime cruise departs Cook’s Landing on Bailey Island at noon, and cruises through Potts Harbor, past Eagle Island and Haskell Island, with a peek at Mackerel Cove.